On Friday morning, I hit the first of the spring consignment sales and found a bunch of really great items that we needed. It was definitely a successful trip! I got to the sale about thirty minutes before the door opened, and managed to snag the second spot in line.With so many little people the same size to shop for, I needed the advantage. I spent a couple of hours combing the racks and shelves for the best deals and then found myself a little corner to sort through my items. I always take a few minutes to double check what's in my bag before checking out since there are no returns. I had at least three ladies stop me during the few minutes that I was sitting in the corner and comment on my method of shoe shopping for kids. I guess I thought more people used this method? But maybe not. So in an effort to ease the shopping stress of other moms with little kids, this is how I shoe shop for toddlers. First of all, you have to understand how I shop. I hate shopping, so my mission is to get in, get what I need, and get out as fast as I possibly can. Consignment shopping is the only type of shopping that I sort of enjoy since it's more like a treasure hunt. But I'm still not willing to drag my quadruplet toddlers through a sale with me. That sounds impossible and so far from enjoyable that it makes me squirm even thinking about it. So instead, I just bring their feet with me. Every time I go to a sale, I pop a piece of card stock on the kitchen table, and Sean holds the kids' feet in place while I trace them. 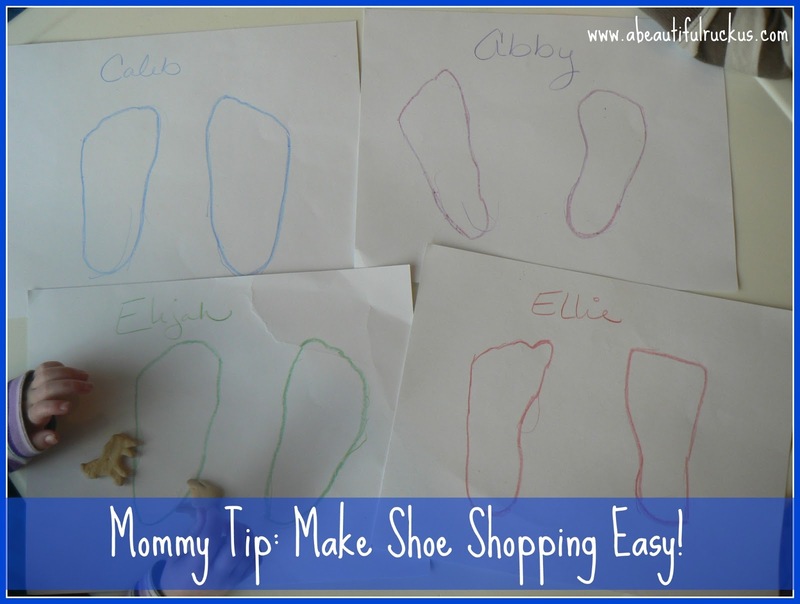 I make sure that I trace them in their color and write their names at the top so that I can keep track of who I'm trying shoes on. On the back of each paper, I write their current size for reference. I also include what shoes and sizes we already own for that particular kid, and what I need to pick up at the sale to get us through the next six months. My goal is to always keep a current size and two sizes larger on hand for each kid to avoid being stuck buying shoes at retail. I didn't quite calculate correctly last fall and had to buy Ellie a pair of shoes at Walmart a couple of months ago. The cheapest pair on the shelf was easily three times more than what I typically spend! Once I've finished my treasure hunt at a sale, I find myself a little corner and start "trying the shoes on them." I've found that shoes differ about as much as clothing does within sizes. All you have to do is hold the shoe up to the template to "try them on." It lets you check length and width without having the kiddos right there with you. I will caution that this isn't 100% accurate, but it's close enough to streamline the whole shopping experience. I've definitely saved money (and sanity) this way! 1. Their feet can grown insanely fast! The consignment sales I go to are about a month apart. I retrace (or at least check) their feet right before each sale to make sure that there are no major growth spurts that I have to account for. 2. Look for velcro instead of shoe strings! Oh yes, I did learn this one the hard way. Velcro is infinitely easier to deal with when it comes to getting shoes on little wiggly people! 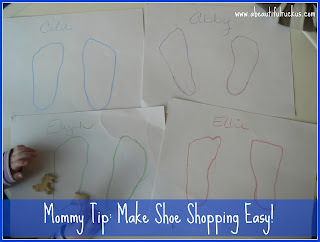 I'd love to know if you have any shoe shopping tips or other shopping tips when it comes to your kids. Please leave a comment if you do! I'm always on a quest to make life a little more streamlined! I never been consignment shopping. I always get very nervous. I think it is a great idea to just bring the feet. Learn how to make curtains for your little one without knowing how to sew! You should definitely give it a try! You might really like it! What a great idea! I always get my kids' shoes at Walmart and buy a size bigger so they can wear them as long as possible. At the last twins club super sale I went to I found some cute shoes I wanted to get but because I didn't have my twins with me I couldn't see if they would fit so I didn't buy them, and of course ended up paying more than double for WalMart shoes a few months later. Oh no! Hopefully this helps at your next consignment sale. I hate paying full price for shoes! That is a clever idea. I love it! We will have to try that. Thank you. No prob! Best of luck! I will be doing my first consignment sale in April for our twins that are due in June. Can you do a post on what you deem to be good prices at these? What is a good deal and what should I hold off on until the next one. I am lucky that I will be able to hit two before they are born so I don't want to over spend on the first. Hmm...I will certainly give it a try! I imagine that "good prices" vary throughout the country, but I can probably come up with a list of what I like to pay here in the midwest. Thanks for a great post idea! I'll try to have that one up sometime in March! Oh! I bet she was the one waiting in line in front of me before the sale opened. She seemed super sweet! I hope she found some good stuff. we LOVE velcro shoes for kids too!! Yep, I realized *after* I bought shoes for Ellie that they had shoe strings, but I was too cheap to buy new shoes, so I just dealt with it. Now I make sure all shoes are velcro! Please be careful doing this! I'm a children's shoe-fitter and so many young children are coming to me because they have major problems with their feet because of incorrectly fitting shoes. I understand that shoes can be expensive but a lot of stores offer a free fitting service and don't require you to buy the shoes they offer. So you can find out their size accurately. It definitely gives you more peace of mind. If you do want to do it alone then just remember that you need a thumb width at the front of the shoe; you should just be able to feel their feet at the sides but not too clearly and without lots of baggy space; and just make sure that they don't slip at the back buy pulling at the heel when they are sat down. There are definitely less problems with older children as they can tell you if something is uncomfortable but for toddlers and under 5s it is so important to be careful as their feet are still developing and you could damage the bones and ligaments if they have bad shoes. Properly fitting shoes can save money in the future because they can prevent you from needing expensive orthopaedic insoles to correct problems, trust me! Thank you for your comment! Absolutely, like any shoe purchase, these shoes should be tried on and then not worn if they don't fit. It's fairly easy to find shoes in great condition at consignment sales since they check them before they go out on the floor, and kids grow through sizes so quickly. As long as you use a little common sense when using this method, it can save a lot of time and money in the long run! Do you have any tips on how to find the consignment sales in a given area? I only know of one in mine and stumbled on it accidentally, and am hoping to find some more but don't know where to start. I would google for "your city" plus consignments sales. Also, check the websites for places like, "Just Between Friends" or "Here we Grown Again" or "Rhea Lana." They have location finders available. Another thought is to check with your local multiples group (even if you don't have multiples). They will most likely be able to tell you what consignment sales are in your area. Hope that helps! This reminds me of when I was a kid and my cousins from the phillipines would send us paper cut outs of their feet. Shoes were always the first request when it was time to send them a package! Hello! 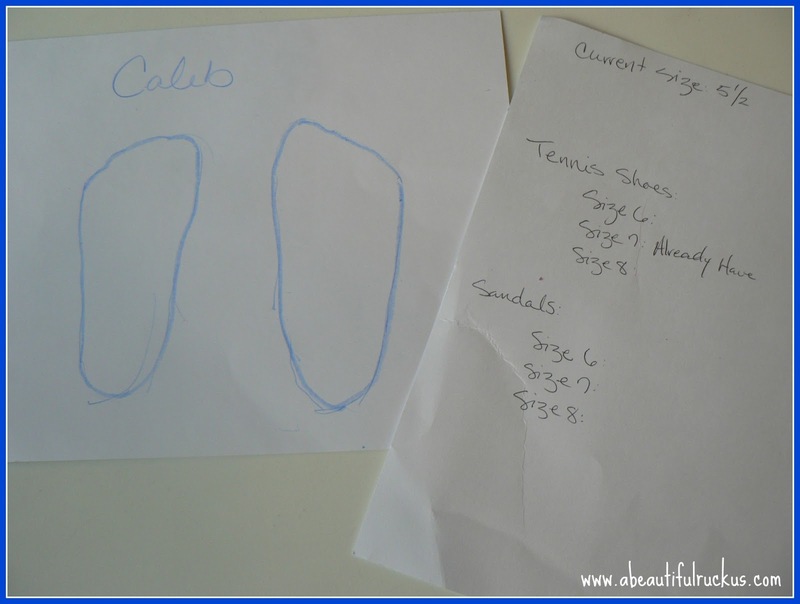 I am a children's shoe manager and bringing in cutouts of the feet does help. The method that will help you get the most accurate fit would be to slip the cutout into the desired shoe. But please keep in mind not only the width but the instep (height or thickness) of your child's foot. Toddlers have a tendency to have a chubby instep which will affect those velcro closures that parents love so much. And please heed the advice of your shoe salesperson. Most of us are only trying to help you get the best fit for your child and sometimes it may not be the most popular brand or style. When I opened this link, I thought the tip would have been to use plaster paris foot somehow and I was curious to find out how to make one. Because as previous person said, the height and chubbyness of the foot has an impact on the shoe fitting. I love consignment shops! Once Upon a Child has been a Godsend for our family! Will definitely try this tip next time I go. I can't do Velcro. My 11 month old can just take them off. I like laces with those bell topped lace keepers. He plays with the bells while I put the shoes on.